Medical advances hold the promise of cures for neglected diseases that afflict more than a billion people every year. But getting these new medicines into the right hands will take more than product development: It takes enlightened partnerships. The future of biomedical innovation is incredibly bright and changing at lightning speed. Therapies and preventive approaches will soon be more precise in their targeting, more accessible, and more effective. These three pillars — precision, access, and effectiveness—will be made possible through innovative partnerships between the public and private sectors, partnerships aimed at bringing the most advanced science to bear on the world’s greatest health challenges. As we learn more about the pathophysiology of a disease, it is clear that we need to move away from the one-size fits all treatment approach. Illnesses we currently group into single categories, such as “cancer” and “diabetes,” are actually hundreds of different diseases. Once we know the genetic abnormalities causing each disease, we can develop precise medications for each abnormality. Pfizer pioneered precision medicine in non-small cell lung cancer (NSCLC) by introducing the first biomarker-driven therapy to treat ALK-positive metastatic NSCLC patients. A biomarker test can determine which patients have an ALK gene alteration and would likely respond to this therapy. We can expect many more precision medicines in the decade ahead, which can hopefully change outcomes for patients battling difficult to treat diseases. As we learn more about the pathophysiology of a disease, it is clear that we need to move away from the one-size fits all treatment approach. Illnesses we currently group into single categories, such as “cancer” and “diabetes,” are actually hundreds of different diseases. There are also challenges in financing, particularly in developing countries—but tangible solutions are possible when public and private entities pool resources, share knowledge, and develop solutions together. At the time of the Ebola crisis, many major vaccine companies were on two phones at once. Companies looked at what could they provide; for Pfizer, that meant manufacturing capacity, and having conversations with the companies who may need help making a vaccine available. Partnerships bring together people with different skills and different experiences, and perhaps even different points of view. These are the types of partnerships we need to help solve for other health needs. 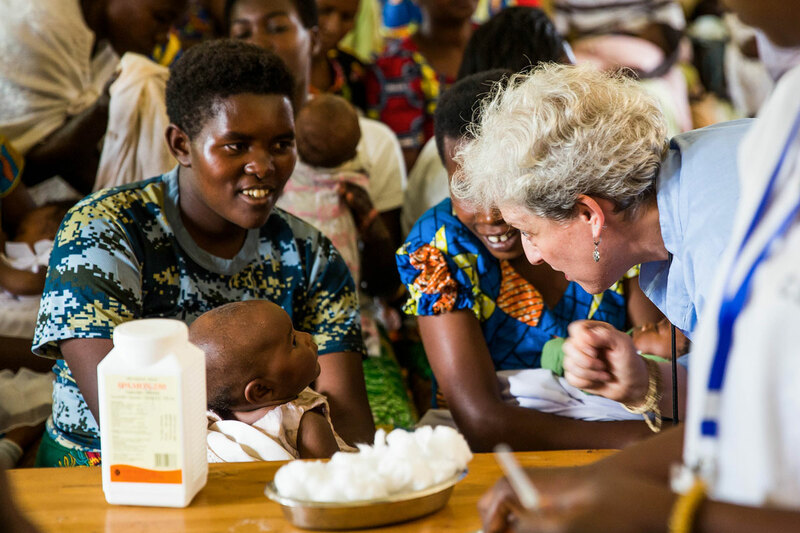 Susan Silbermann, President and General Manager, Pfizer Vaccines, during a recent visit to a vaccination clinic in the rural Rwamagana district in Rwanda. Rwanda was the first Gavi-eligible country to introduce pneumococcal conjugate vaccines as part of the routine national immunization programme (NIP) in 2010. Partnerships are important not only in times of crisis. They’re needed at all times, particularly when it comes to providing access to vaccinations. There is no reason why any person, anywhere, should die from a vaccine-preventable disease. Pfizer and other companies have made multi-year commitments to provide unprecedented numbers of essential vaccines at reduced prices to those who need it most through Gavi, the Vaccine Alliance. The Alliance partners provide vaccines to people in need in the world’s poorest nations, as well as education to local communities. In Rwanda, for example, Gavi is working closely with local leaders to provide immunization access to all, and to make sure that all families understand the value of these vaccines. Many mothers, recognizing the potential of vaccines, are willing to walk long distances to have their children immunized, and the number of children receiving life-saving vaccines is remarkable. It takes a village to raise a child, as the saying goes. Without partnerships at all levels these children wouldn’t have the best chance to lead healthy, productive lives. These kinds of connections will allow us to tackle some of the world’s most difficult problems—both the ones we know about and those still unknown to us. Imagine when we can fully realize the potential of gene therapies that use new genes to replace defective or missing genes, immunotherapies that harness the body’s natural defenses to fight cancers or other diseases, and vaccines deployed as “treatments” for non-communicable diseases, possibly including Alzheimer’s and addiction. The coming decade will greatly expand the spectrum of diseases that can be prevented, treated, and even cured through medical interventions, as well as who has access to these advances. Imagine when we can fully realize the potential of gene therapies that use new genes to replace defective or missing genes, immunotherapies that harness the body’s natural defenses to fight cancers or other diseases, and vaccines deployed as “treatments” for non-communicable diseases, possibly including Alzheimer’s and addiction. Even the concept of protecting infants before birth, through maternal vaccination, is a bright possibility. Precision, access and effectiveness will emerge from a system that itself is a breakthrough—a highly dynamic research and development ecosystem that opens the door to new standards of collaboration. It’s an ecosystem that merges knowledge that will be very different from the one we know now. The world will continue to change us, and as innovators, we will continue to change the world. Susan Silbermann, president and general manager of Pfizer Vaccines, is responsible for the commercial development of therapeutic and preventive vaccines to treat serious and life-threatening conditions.